It would be wrong to get too carried away by the overnight US missile strike on the Syrian airbase, north of Damascus, from which it is believed the Assad regime launched Tuesday’s despicable chemical weapons attack. This was, after all, just a single retaliatory strike on an air base, and not a 180-degree change in US military policy. We don’t know what the Trump administration’s ongoing policy will be, should President Bashar Assad carry out further chemical weapons attacks, and we certainly have no sense that President Donald Trump will now be seeking to oust the Assad regime. In less than three months, the much-mocked President Trump has achieved in the Middle East what Obama never sought, or even wanted to do: He has gained the trust of Egypt’s President Abdel-Fattah el-Sissi, Jordan’s King Abdullah II and Saudi Arabia’s King Salman. Even the leadership of the Palestinian Authority is unstintingly in its praise of his Middle East policies and his efforts to revive the peace process with Israel. The pragmatic Sunni camp, which felt itself so at odds with Obama, finally senses that it is being heard and heeded in Washington. The US administration is building relations with the correct side in this region, rather than gambling, as Obama did, on the political Islam characterized by the Muslim Brotherhood. But more than this, the US retaliatory attack sends the clear message to the Shi’ite camp — Iran and Hizballah — and to its Moscow patron, that the party is over. Only this week, Abdullah was warning about the Iranian effort to forge an area of control extending from Tehran to Beirut and Latakia. Through a single, limited strike, Trump’s overnight resort to force signaled to the Shi’ite actors, and to Russia, that the rules of the game have now changed: From now on, there will be a price to be paid for invading, massacring, carrying out terror attacks, using non-conventional weapons. Such a message ought to have been delivered long ago, years ago. But Barack Obama opted not to do so. And as a consequence, the United States became perceived as weak, as afraid, as a nation that abandoned its allies in the Middle East. The overnight attack sent a very different message, especially to Assad’s opposition. Moscow’s rapid, angry reaction, and the immediate messages of support from Saudi Arabia and from the Syrian opposition, underline how successful the single US strike has been in impacting all the necessary places. Not just the physical impact, either. Russia will now have to reassess its handling of the Syrian crisis. 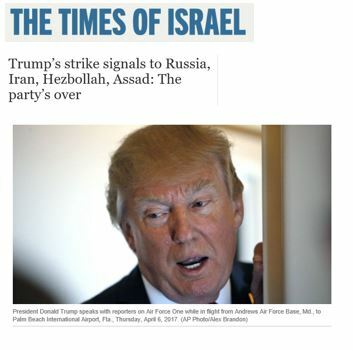 And as for Iran, Assad and Hezbollah, they will all have to weigh their next moves in what was once greater Syria with a great deal more care than before Trump hit back. « Is It Time to Break Up Google?